Make this St. Paddy's Day your greenest! A portion of every purchase is donated to environmental conservation and wildlife protection. With a My E-Cards account, send special animated St. Patrick's Day cards! Other features include scheduling E-Cards ahead of time, saving all sent and received cards, and uploading your own images to send as E-Cards! Bring a little cuddle into St. Paddy's Day! A Beanie Babby with some true Emerald Isle spirit. There's nothing greener than the GreenLeap Froggie! Choose great St. Paddy's gifts adorned with our signature frog on organic and conventional T-Shirts, environmentally friendly tote bags, mugs and many others, and give our environment a green boost! 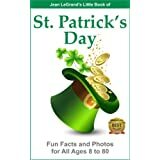 A short book of facts, trivia and photos to enliven your St. Patrick's day.